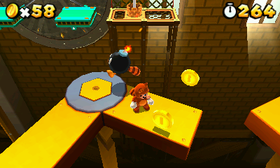 Tail Bob-ombs are Bob-ombs with Tanooki tails. They are a species which were first appeared in Super Mario 3D Land. Unlike ordinary Bob-ombs, they have the ability to descend slowly from the sky. They are not able to stand upright, and remain sitting down on the ground in the spot they land at and quickly explode. They only appear in World 7-4, Special 7-3 and Special 8-Crown. The player is able to defeat these enemies by running into them while they are sitting on the ground. Jumping on them has little effect, and it merely shifts the Bob-omb's position. They can damage Mario (or Luigi) by falling from the sky and landing on him, or being near the bros. when they self-destruct. 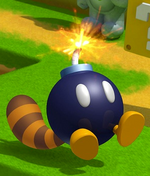 Tail Bob-ombs behave in a similar way to Para-bombs in previous games. This page was last edited on January 12, 2019, at 13:45.